Clean, Tidy, Friendly! Our quality amenities will ensure your stay is hassle-free. Everything you need for the perfect holiday escape! We have a range of accommodation to suit all budgets and holiday choices. Our amenities are clean and kept in quality condition to ensure your stay is comfortable and hassle-free. Linen and Towels – Provided for all onsite accommodation including cabins, huts, villas and leisure units. BBQ – A great BBQ area with adjoining outdoor and indoor eating area. Camp Kitchen – Enjoy cooking up a storm in our spacious camp kitchen. Laundry – Space to wash and dry your clothes & linen. Showers & Toilets – In a central location and easily accessible. Kiosk – Well stocked kiosk available for our guest’s convenience. LP Gas – Refills are available, just ask one of our staff for assistance. Movies – Relax, kick back and enjoy our movie nights. Sullage – Available on camping and caravan sites. Fuel for Boats – Need more fuel? We sell fuel at our holiday park. Dump Point for Caravaners – Our holiday park has a dump point. Private Boat Ramp – Only accessible to guests of our holiday park. Online Grocery Shopping – Pre order your groceries online from Woolworths and we will pack your order in your accommodation and/or fridge before you arrive. 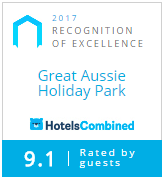 This is just another way the Great Aussie Holiday Park team can make your holiday stress-free!. Local Knowledge – Experience the local region and all that it has to offer. Ask our holiday park staff for local tourist information. Lakeview Cafe – Provides delicious holiday snacks and cafe meals that will delight even the fussiest of taste buds. *Opening times vary depending time of year – please check with reception. Fire Pits – Fire pits are allowed at Great Aussie Holiday Park. Please check with our staff whether your fire pit meets our guidelines for use. Download the Fire Pit Guidelines here. Dogs Allowed – Friendly, well-behaved dogs are welcome for all camping and caravan sites. Unfortunately, as much as we love four legged friends, we are unable to accept dogs and/or pets in our villas, cabins, huts and units. Conditions apply.